Museum Monday–Saturday, 10 a.m. to 5 p.m.
Research Center Tuesday–Saturday, 10 a.m. to 4:45 p.m.
On Wednesday, May 1, galleries and spaces in the History Center will be unavailable to visitors due to the Oklahoma National History Day competition. 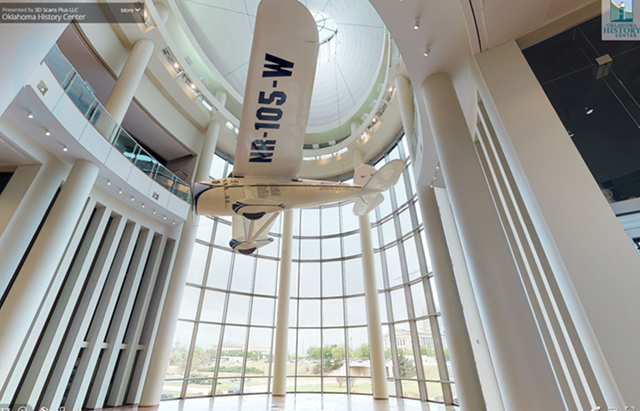 Explore the Oklahoma History Center exhibits and grounds in our new virtual tour. Click to begin the tour. The Oklahoma History Center is an eighteen-acre, 215,000 square-foot learning center exploring Oklahoma’s unique history of geology, transportation, commerce, culture, aviation, heritage, and more. The Oklahoma History Center is a Smithsonian Affiliate and is accredited by the American Alliance of Museums.